It's Thursday and time for the next episode in the Table Top biweekly series hosted by Star Trek's Wil Wheaton on Felicia Day's Channel Geek and Sundry. 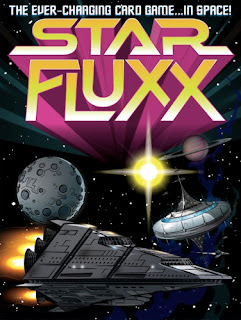 Today's featured game is the ever-changing card game, Star Fluxx. Fasten your seat belts as it's time to get lost in space with Wil Wheaton and his guests: Chloe Dykstra (host - 4 Points), Alex Albrecht (host - Just Cos), and Jordan Mechner (creator - Prince of Persia) as they play Star Fluxx. You will find Star Fluxx and other themed Fluxx card games in stock and available here at Off The Charts Games. For even more information you can also read our game write-up by clicking here on Game Profile: Fluxx. Other themed Fluxx's that we have include: Cthulhu, Eco, Martian, Monty Python, Oz, Pirate, and Zombie Fluxx. And, don't forget there's the non-themed original Fluxx as well as Family Fluxx aimed at ages 6+. So pick your flavor of fun.